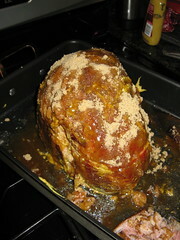 New Year's ended up being a 3 days feast at our place starting with a ham dinner on the 30th with friends & my parents. I planned to make a turkey but Matt said he'd been wanting to try this recipe from Alton Brown for awhile so I went with it. I thought this recipe sounded a little out there with the ham coated in mustard, bourbon & crushed ginger snaps but man was it ever good. The glaze gave it a wonderful tangy, sweet flavor. Oh & the leftovers, heaven! Rinse & drain ham throughly. Place cut side down in a roasting pan. Use a small knife to cut diamonds into the skin & first few layers of fat . 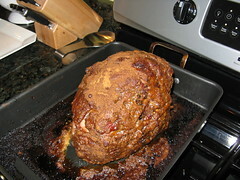 Tent with foil & insert a thermometer into the center of the ham. Bake for 3 -4 hours until the temperature registers 130 F. Use tongs to remove the diamonds of skin & fat that comes with it. Dry the ham & them coat with the mustard. 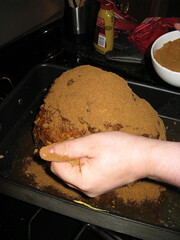 Now cover with the brown sugar then spray the bourbon all over it. Pack the as much of the ginger snaps as you can all over the ham. Cook until thermometer reaches 140 F about 1 hour. Let sit 1/2 hour before serving. We served the ham with biscuits, mashed sweet potatoes & beans. Now we've got a ham hock just calling out to make soup! I have a ham in the fridge and I would love to try the coating. It sounds great. Happy New year! The ginger snaps sound like an amazing addition. Its making me hungry just looking at it! It does sound weird but I can see where the flavors wouldmake one tastey ham. I am so jealous of tha home bone. What are you going to make with it. I guess I will have to stay tuned! You've convinced me to give this recipe another try. I attempted it back at Easter last year and the ham came out dry...I know I must have done something wrong. Yours looks so juicy and inviting, I've got to try it again! Wow, that sounds good. I don't like ham, but I would try it again if I could have a bite of this! I saw this on Good Eats and really wanted to try it too. Yours looks like it turned out great! Oh, I remember that episode of Good Eats! I'm glad to know it turned out so well for you. I'll have to find an excuse to make it...maybe for Andrew's birthday "meat-a-palooza" at the end of the month. i've never heard of city ham. country ham, yes. city ham, nope. it sounds terrific, though--brown sugar, mustard, and ginger snaps must make a glorious combination! 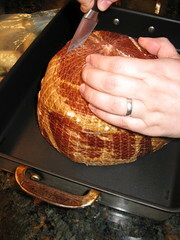 Kat, you've renewed my interest in cooking up a big ham...she's a looker. One of my friends made this ham for Christmas and it was SO GOOD. ... Excuse me, I think I might be drooling a little bit. 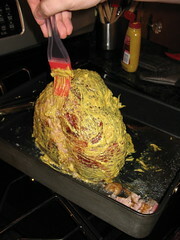 I made a ham for Easter last year, and loved the recipe, but I just might have to try this one this year! I've been making this version of ham ever since I saw the episode. It is bar far the best recipe, and it always turns out great! That sounds and looks absolutely wonderful. 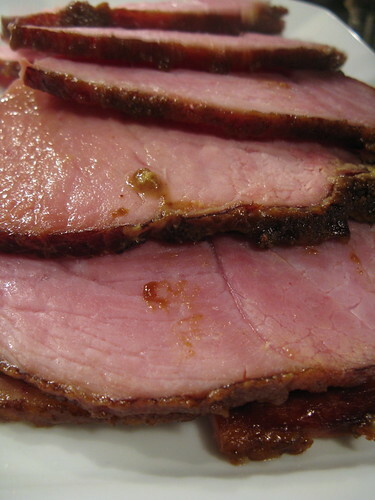 I so love a baked ham, so I'll be trying this for certain. Thanks, Kat! Looks so juicy and delicious! Saw this episode too and have been dying to try this. 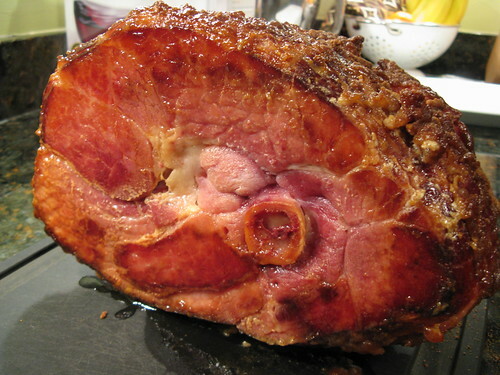 What I like most about hams is the crispy, sweet, exterior and this sounds like it would be manna to me! Unusual ingredients but it turned out delicious, so who's to argue?